The longest running and most-watched kids action series in television history continues with Power Rangers Super Megaforce: Sky Strike arriving on DVD (plus Digital), Digital HD and On Demand June 9 from Lionsgate Home Entertainment. In these five action packed episodes, the iconic Power Rangers, Troy, Noah, Emma, Jake and Orion must work together to save the world when Vrak returns to annihilate our planet. 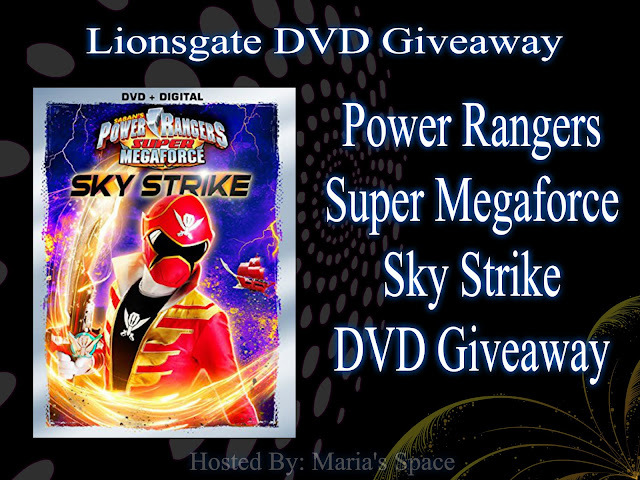 The Power Rangers Super Megaforce: Sky Strike DVD will be available for the suggested retail price of $14.98. The Power Rangers are in for the fight of their lives as they battle their greatest enemies yet -- dimension-hopping Professor Cog, Prince Vekar's mighty Armada Megazord, Emperor Mavro and his Royal Guard, and Damaras, the most lethal warrior in the universe! When Vrak returns, transformed and more powerful than ever, he will turn one of the Power Rangers' most trusted allies against them -- the Super Megaforce team will never be the same after facing Dark Robo Knight! My son got into the Power Rangers about 2 years ago after never wanting anything to do with them. He loves them all and has no favorites. I never watched them but see why he likes them. I did watch Power Rangers when I was little. Kimberly the pink ranger was my favorite. I didnt watch it...but my kids did. The Pink Power ranger was their favorite. My kids watched it when they were younger. The pink ranger was my daughters favorite and the red ranger was my son's favorite. It has been a while since I watched it but in the old version I liked Tommy the best. I think he was the green one. I never watched the Power Rangers as a kid. I would think the pink one would be my favorite. Oh, boy, my nephews watch this all the time! As a kid, I never watched it. I guess the blue would be my favorite.